Myanmar Popular Tourist Places tourism Guide App offers detail information about all the popular destinations and most visited attractions of the country and help you to find best spots to spend your vacations. 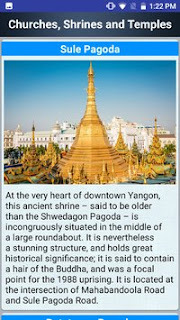 Myanmar also known as Burma is a country in the Southeast Asia and one of the most magical destinations in the world. 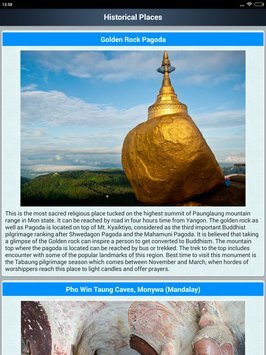 Myanmar is the golden land of breathtaking natural beauty and charm with the rich in history culture and tradition. 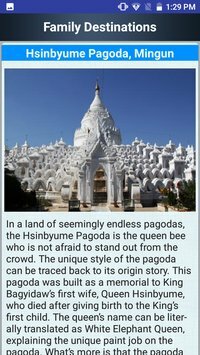 Myanmar has many Islands and surrounded with see with the amazing diversity of flora and fauna and awesome underwater scenes and marine life. In this App you will find all the information about Top Tourist Attractions Temples and pagodas Famous Monasteries Top Wonders Best Beaches Monuments Top Museums Historical Places National Parks and wild life sanctuary Family Destinations Cities to Visit Famous Caves Famous Island Churches, Shrines and Temples Adventure Sports Destinations Beautiful Lakes and Waterfalls Festival and Cultural Activities Famous Shopping Streets Famous Street Foods and many other valuable information.